This week I was at The Wildlife Art Society's Annual Exhibition at "Nature in Art", Twigworth, Gloucester, and spent a day demonstrating in pastels for visitors. 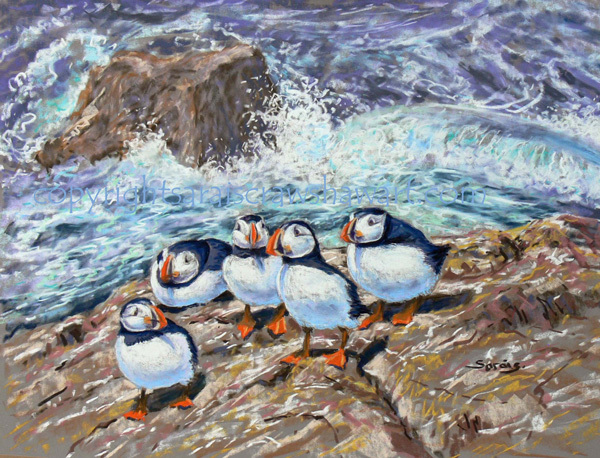 I chose to portray some puffins in front of a stormy sea, which I saw a few weeks ago at the Farne Islands in Northumberland. I have painted this type of subject several times before, but never tire of showing the little birds, or the swirling waters off the islands. This year when I visited, it was particularly blustery, and I intend to make several paintings including the rough seas and the birds there.